Amatrol’s eLearning on Kindle Fire tablets! Amatrol’s eLearning is now compatible with Kindle Fire tablets running OS 2.2 or higher through Amatrol’s Mobile eLearning app! Instructors now have an inexpensive tablet option for their students to access Amatrol’s interactive eLearning on Kindle Fire. 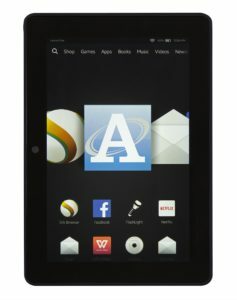 The Kindle Fire joins specified Windows tablets, iPads, Google Nexus tablets, and more! For a complete list of compatible tablets, please click here. Amatrol’s Mobile eLearning app is available for free in the Amazon store, Google Play, and iTunes. To learn more about Amatrol’s Mobile App, please visit our Mobile eLearning App page.